We are still swimming and sorting through 8800 pounds of stuff that we managed to collect and carry across the country to our new home. Eighty-eight hundred pounds. Of Army gear, baby gear, toddler toys, clothes, fabric, antiques, books, and impulse purchases...piled onto a mounting To Do list including arrange furniture, paint, trim trees, stain the deck, start a lawn...and yet my first trip to the store was for our flag. I'd been looking forward to putting one up on our house all summer long. There was a time when I thought some people were too sensitive about our flag. Don't get me wrong; I never thought it was okay to burn or otherwise totally disrespect the flag, but short of that I considered any further fuss about the American flag just that - fuss. And then I grew up a little, and married a soldier, there was 9/11, and I sent my husband to war. And I understood. That the fuss about the flag - how to display it, how to fold it, how to take care of it - wasn't so much about the flag as it was about honoring everything and everyone it stood for. The weekend before we left Washington was Memorial Day weekend. I was feeling sad about our move out of the military. And when I walked into our (rather large) church auditorium, we were greeted by two huge American flags flanking either side of the stage. It actually took my breath away and I teared up at the sight of them. I was completely awed by them the entire service. Never again will I be so apathetic about such a symbol. I feel extremely proud and lucky to have been born in this country. And I think it's okay to be proud. Not arrogant, or cavalier. But grateful, humbled, and appreciative of everything we enjoy as Americans. I'm grateful for my freedom. And I'm especially grateful to those who volunteer to protect it. To protect us. For those of you who lost a friend or family member six years ago or in the ensuing battle in Afghanistan since, I'm truly sorry for your loss. My family is thinking of you today. Wow Crystal, what a beautifully talented photographer and writer you are! I don't know how I came upon your blog, I think I googled a pattern for a sewing project and now I find myself enthralled in your story. I am 23 yrs old and not yet a wife or a mother, so I cannot relate as other people can in their comments, but I must tell you that you paint your stories in such a way that I can relate to how you cope with your thoughts and feel as if I know you now. What creative power you have. Thank you for sharing yourself. Bless you and your family. Thank you for thinking of the families still in the military and dealing with the never-ending deployments. Mine's in Afghanistan right now. 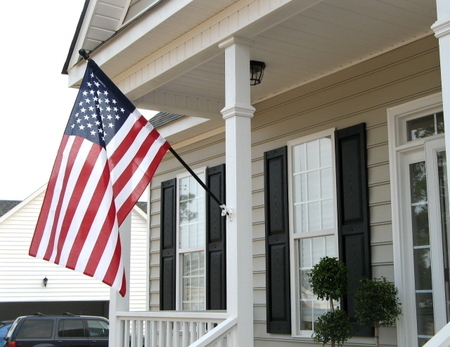 I respect the flag more then ever these days and hang mine proudly on the front of our home. Beautifully written. I love our flag and I love flying it. It is an awesome sight and reminder to us not to take it or those that fight to protect it for granted. Good to see you are getting settled. Sarah said she is going to send you something so I gave your mail to her. I love the blue in the kitchen, and everyone that comes over does too. Even my mother in law. Don't forget to drop the garage door opener in the mail if you get a chance, or even come across it. I couldn't agree with you more. Before I married into the military there were certain things that I simply took for granted; the flag was definitely one of them. Now my perspective is forever changed.